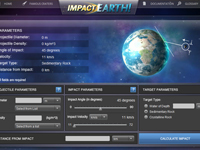 Onlive Soft > Impact: Earth! Home > Science & Education > Impact: Earth! Impact: Earth! – is a Web-based program for quickly estimating the regional environmental consequences of a comet or asteroid impact on Earth. The program requires six inputs: impactor diameter, impactor density, impact velocity before atmospheric entry, impact angle, the distance from the impact at which the environmental effects are to be calculated, and the target type (sedimentary rock, crystalline rock, or a water layer above rock). The program includes novel algorithms for estimating the fate of the impactor during atmospheric traverse, the thermal radiation emitted by the impact-generated vapor plume (fireball), and the intensity of seismic shaking. The program also approximates various dimensions of the impact crater and eject a deposit, as well as estimating the severity of the air blast in both crater-forming and airburst impacts.